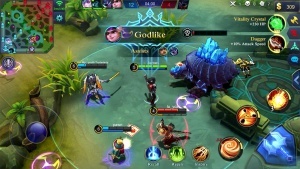 Mobile Legends: Bang Bang is a MOBA game designed for mobile phones. The two opposing teams fight to reach and destroy the enemy's base while defending their own base for control of a path, the three "lanes" known as "top", "middle" and "bottom", which connects the bases. In each team, there are five players who each control an avatar, known as a "hero", from their own device. Weaker computer-controlled characters, called "minions", spawn at team bases and follow the three lanes to the opposite team's base, fighting enemies and turrets. 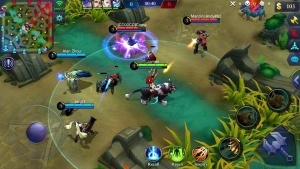 This article uses material from the Wikipedia article Mobile Legends: Bang Bang, https://en.wikipedia.org/wiki/Mobile_Legends:_Bang_Bang, which is released under the Creative Commons Attribution-Share-Alike License 3.0, https://creativecommons.org/licenses/by-sa/3.0/.